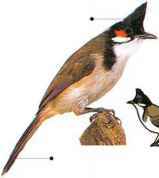 An agile, active, and sometimes noisy bird, this bulbul is commonly seen in orchards, gardens, town parks, and secondary woodland (regrown after forest clearance). 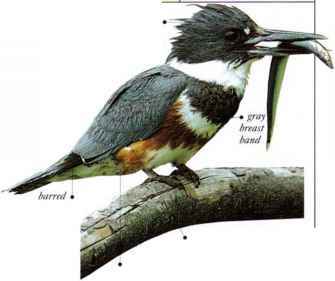 It searches for insects, fruit, and buds, making characteristically short, jerky flights and often working in pairs. • NliST A shallow, neat cup nest of twigs and dead leaves, with finer lining, bound with spiderwebs, placed in a tree. • Distribution Parts of India, China, and S.E. Asia. Introduced in USA and Australia. A common bulbul of lowland rain forest, this species is recognized by its combination of a puffy white throat, yellow underparts, and the absence of a crest. Being relatively tame, it is easy to approach. 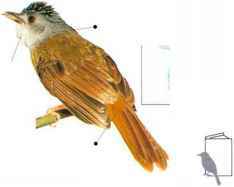 Normally a solitary bird, it keeps to the lower levels of the rain forest, where it feeds mainly on berries and small beetles. • NliST A shallow cup nest made of plant fibers, lined with fine coconut hairs, and placed low above ground in a bush or tree. Loose-plumaged, nervously active and noisy, the Black Bulbul inhabits oak, pine, and rhododendron forests in mountains, feeding on berries and larger fruits. At higher altitudes, it occurs only as a summer visitor. • NliST A neat, flimsy cup made of grass, leaves, and moss, in a tree fork. • DISTRIBUTION Indian subcontinent and parts of China and S.E. Asia. Northern populations migrate southward in winter. 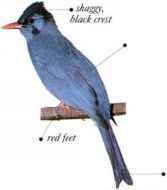 • REMARK There are several distinct geographical forms of this bird, the one-shown here being the Himalayan subspecies.